Roasted tomato sauce, ready when I need it. A great use for all those summer tomatoes! Like other backyard gardeners, I wait long weeks through most of the summer for those first ripe, sun-warmed tomatoes. But truth be told, there are only so many fresh tomato tastings, BLT sandwiches, and caprese salads a moderate tomato liker such as myself can handle. On my first post-vacation harvest, I came in with a shirtload of our favorite heirlooms, the Cherokee purple. Far too many for BLTs...however, just the right amount for a batch of roasted tomato sauce! Within an hour, these just ripe tomatoes, gently unloaded from the bottom half of my shirt were transformed into a couple of generous portions of sauce that I froze and will certainly thank myself for on some future busy weeknight. optional: fresh or dried herbs such as basil or oregano (I generally leave the herbs out so I can customize later on according to what I'm using my sauce for). Preheat oven to 400 degrees. Drizzle olive oil in a large baking pan. I usually end up using a couple of pans to contain all the tomatoes. Evenly sprinkle salt, sugar, and pepper in the pan. Cut tomatoes in half (I don't like too many seeds in my sauce, so I squeeze the seeds out into a strainer set over a bowl. The juice that strains through becomes the base for my bloody Mary. If you don't mind seeds and have no interest in the excuse-to-drink-early-in-the-day cocktail, you can skip this step). Place tomatoes cut side down in the pans. Throw the garlic cloves in with the tomatoes. Halved Cherokee Purple tomatoes ready to go in the oven. Roast in the oven for about 40 minutes. Remove from oven and allow to cool completely. Pull off skins and break up tomato chunks with a fork or potato masher. Reheat if using, or pack, label, and store in the freezer. *** Often, the tomatoes will release a lot of juice while cooking, making the sauce too thin for my liking. I will either pour off some of the liquid (which I could use for another purpose like as a soup base), or I'll mash the tomatoes as usual and then cook the sauce down a bit to thicken it up. Fork-crushed and ready to go! Puree with a stick blender if you prefer a more even texture. No part of this process goes to waste! With the tomato juice that I've strained into my bowl, I end up with one perfect portion of the base for one of my favorite cocktails (I just add a few ounces of vodka). While I just make a single serving of my friend Brie's bloody Mary mix, she is a huge tomato grower and mixes up zillions of mason jars full of the stuff - chilled on ice and ready to add merriment to an annual summer bash she throws. She knows her bloody Marys. 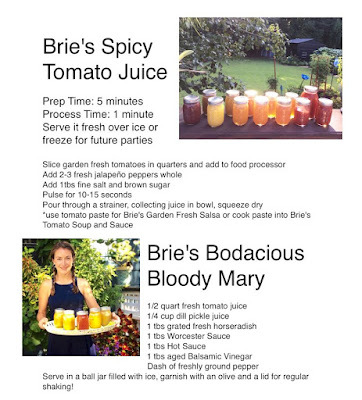 Here's Brie's recipe below for a big invite-your-friends sized batch of the mix. Haven't tried her spicy tomato juice yet. I'm saving that one for after this weekend's pepper harvest! I squeezed the seeds out of my tomato halves and ended up with this jar of juice. It's ready to use in the freshest, lightest-yet-most-flavorful bloody Mary I've had! Thanks for the recipe Brie! This recipe looks yummy! but I don't have fresh harvested tomatoes!